Millions of people are entertained by Chess, and the internet has increased the game’s popularity. Because of the boost in gaming communities, more players are looking into sharpening skills and seeking the best chess strategies to beat their opponents. In general, it’s easy to learn the basics, but to gain the advantage, you really should learn varied chess strategies to help climb the ranking ladder. You won’t win many games if you blindly stick to any one strategy. Opponents habitually learn “player patterns” so they can identify how the other player will try and win the game. This is why varied strategies increase your chance of beating them. These strategies are long-term plans created by chess players. They are dynamic and are typically changed according to what’s occurring on the board. For example, you initially planned to attack your opponent’s King-side; however, during your attack, your opponent made a huge mistake in his Queenside. You should take advantage of that mistake by transferring your forces to the Queenside. One of the most important areas on the chess board is the center. Controlling this area can contribute to winning chess games simply because the center area allows for each chess piece to have more reach. For example, a Knight on its starting position only has two available moves. But once that same piece is in the center, the number of available moves that can be made is significantly increased. So your first plan should be striving to control the center. What’s your plan to control the center? The most obvious plan will be to move the pawns that are closest to the area and are placed in front of the Queen and King. Aside from gaining control of the center area, advancing these pawns first allows you to move the pieces on the back area. For example, moving the pawn on your Kingside opens the line of sight of your Queen and Kingside Bishop. Likewise, moving the pawn on your Queenside opens a path for the Queen and the other Bishop. Once the pawns have provided the opening, it will be easier for your other pieces to move toward the center and further control the area. Although advancing the pawns in front of your King and Queen allows room for the Bishop to move out of its starting position, it is recommended that Knights should be developed first. Of course, having the Bishop stuck in the corner gives it limited moves, but developing Knights early in the game serves as the best “setting-up” phase. Knights have more limited reach compared to Bishops, so they need to be developed early on so that they will reach more areas once the action picks up. Forks. One basic tactic utilized by both novice and experienced chess players is the fork, also called the double-attack. The purpose of the fork is to capture one of the opponent’s pieces and gain an advantage in personnel. 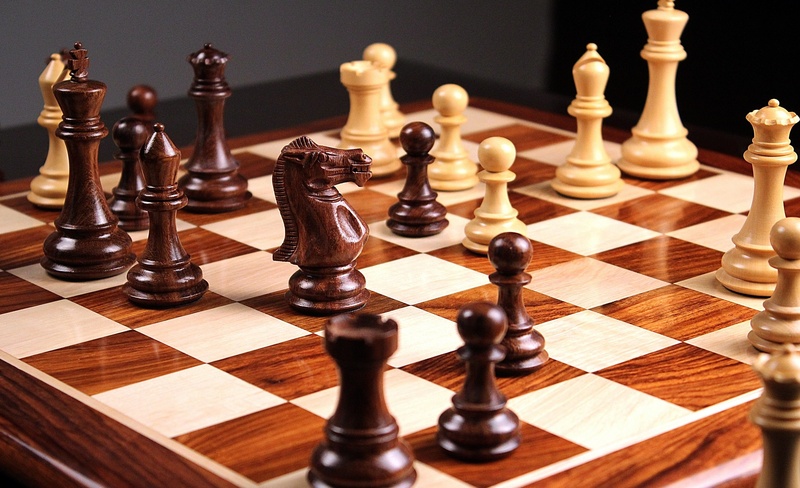 The tactic also forces your opponent to consider which piece should be spared or sacrificed, or which move can be made to somehow reduce the casualties. Imagine that one of your Knights is place at the center of the board. If two of your opponent’s pieces are placed on the possible landing areas of your piece, then your Knight forks these pieces. Even if your opponent moves one of the pawns out of harm’s way, you will still have the chance to capture the other piece. Skewer. Another favorite of chess strategies is using one piece to cover another, thus resulting in a capture. The skewer does not force your opponent to not move a piece; rather, this strategy is aimed at forcing the opponent to offer a less valuable piece in order to save the more valuable one. This move will likely result in a material advantage as your opponent will take the piece with the lesser value. Net. Here’s a tactic that renders your opponent’s piece immobile. It traps your opponent, forcing them not to move, yet they are not directly threatened for capture. While the position of the piece will not have it captured, its position must be held because any move that the opponent makes with that piece will fall on one of your piece’s line of sight and will enable you to capture it. Observing the whole board is the key to being able to deliver this one-move tactic, and to prevent it from happening to you. Jumps. This strategy is a two-move tactic, also called unmasking or an unmasked attack. It involves two of your pieces that provide a threat to two or more of your opponent’s pieces. You move one of your pieces to threaten one of your opponent’s pieces and revealing that another one of your pieces could capture another one of your opponents. In simple terms, a jump reveals that your move is really a distraction so that the opponent is focused on their piece that appears to be threatened. Even if the opponent does move the piece they are focused on, they are still left off-guard because another one of their pieces will still be captured in the process. Undermining. This strategy is also known as “removing the defender.” It involves capturing the defensive piece of the opponent, leaving one of their pieces vulnerable to being captured without having the opportunity to capture one of your pieces. This tactic is effective in the sense that the opponent becomes torn between capturing one of your pieces and saving the piece whose defense is weakened or removed. Overloading. To prevent pieces from being captured, your opponent will make sure his or her pieces are well defended. While a tight defense makes it difficult for you to attack, it’s still possible to create a disadvantage. You do this by overloading. This tactic involves giving another threat or overloading your opponent’s piece with another defensive assignment, which they cannot attend to without abandoning the original position. The idea is to get the opponent thinking to which area should be defended more and which actions will provide him or her with fewer casualties. Each player develops his or her favorite chess strategies that include tricks, attacks and defenses, and the more strategies you develop, the better your chances of winning are increased.